​St. Petersburg is one of my favorite events of the year. The location is so unique, racing down by the water is something we don’t get to do very often in the Pro Mazda series. Over the winter I moved over to the Juncos Racing Team and we have had a dream start to our season. It started in the WinterFest back in February where we won two races, four pole positions and won the championship. We knew based on those results we had a good shot of winning in St. Petersburg. 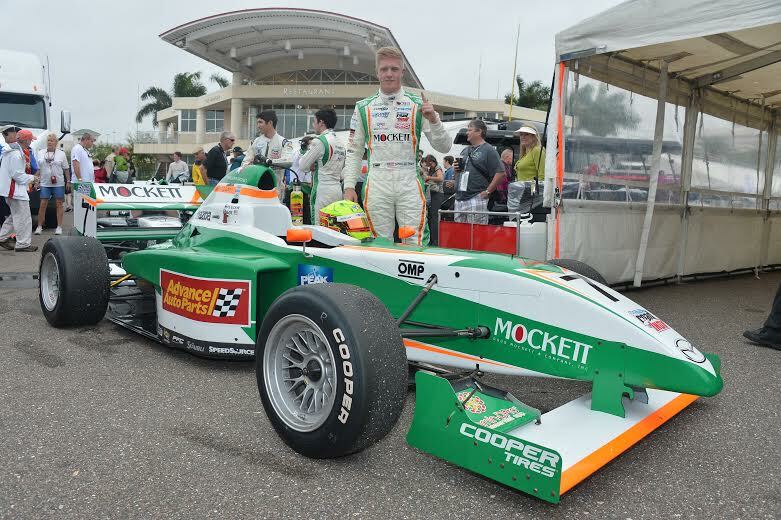 ​I couldn’t wait to get down to Florida for the first race of the main Pro Mazda Championship. Not only because it was time to go racing but I moved to Indianapolis at the beginning of March so I was ready to get out of the snow and back to the 80 degree weather in Florida! I got to the track on Thursday morning, we had a day full of seminars put on by the Mazda Road to Indy covering many different subjects important to up and coming drivers. Friday was the day we were all looking forward to, our first practice session was bright and early at 8:30am. The first session is always tricky because there is no grip on the track. They’re just regular roads so until the IndyCars get out there to lay some rubber down it’s very slick. We ended the first session fastest by just under a tenth but knew we had room to improve. My engineer Ernie, made some changes and the car was great for the second session. We were fastest by over three tenths. ​When we rolled out of the tent Saturday morning for qualifying the sky was black. There had been severe storm and tornado warnings for the area but we got our session in just before the rain started falling. We qualified on pole position! It was a really good result for the team as well, we had three cars in the top 5. Shortly after qualifying we were told to evacuate the track because of the storm rolling in. All track activity was delayed until about 5:00pm that afternoon. They were finally able to run the USF2000 race and IndyCar qualifying. Our race was pushed back to 7:00pm. Thanks to the IndyCars the track was dry except for a few puddles for our race. I got a good start and was able to hold the lead through turn one but there was an incident on the first lap so we went full course yellow. Shortly after the restart there was another crash. Finally we went green again and I was able to pull away to win the race with my teammate Kyle behind me in second. 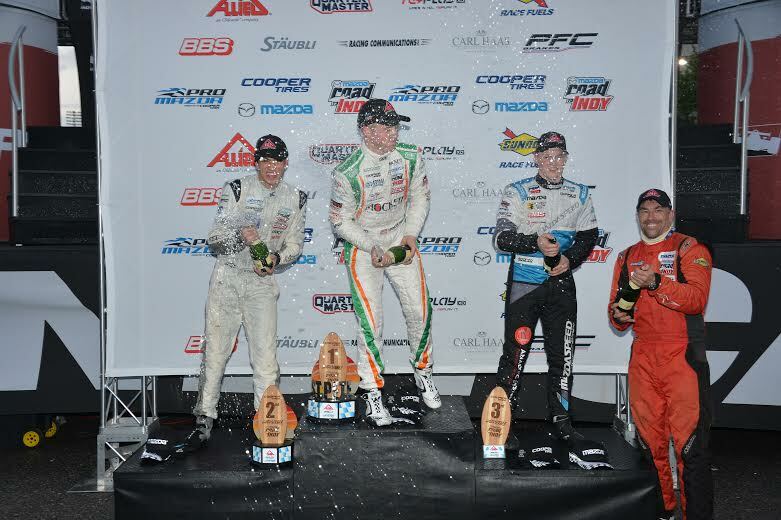 1-2 finish for Juncos Racing to start the year! Couldn’t be better! fun. I had a bit too much wheel spin off the line but it wasn’t too bad and I was able to keep the lead. From there I pulled away to win by about 7 seconds. The car was fantastic, I was very happy the race didn’t go full course yellow because I was having a blast driving around the streets of St. Pete. I got into a rhythm and just concentrated on hitting my marks. It was another 1-2 finish for Kyle and I. We still have lots of races left so we can’t get too excited, it’s a long season. Anything can happen but we’re off to a great start and I couldn’t be happier. Our next race is at Barber Motorsports Park April 25th-27th. ​I have to say thanks to everyone at Juncos Racing and my sponsors: Mockett, Rising Star Racing, The Stutz, Vitamin-D-Pro.com and OMP. Also, Advanced Auto Parts and Peak for coming on board this weekend. Previous Previous post: KNOCK, KNOCK. WHO’S THERE? OBVIOUSLY NOT THE NIELSEN FAMILY. TV RATING NUMBER FOR THE 2014 INDYCAR OPENING ACT AT ST. PETERSBURG NULL AND VOID!